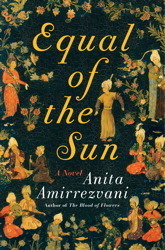 In honor of the release of the paperback of Anita Amirrezvani's Equal of the Sun (you can take a look at my review here), I am pleased to be able to give away two copies of the book. Just fill out the Rafflecopter below (US only)! I loved The Blood of Flowers. This one has been on my TBR list ever since I first heard about it. Would love to win a copy. I would love to read stories set in 16th century Iran. would love to give Equal to the Sun a try!! !